Our mission is simple; "To know Him and make Him known" to our children. Our vision is to give our children a firm foundation, beginning with a strong personal relationship with our Lord Jesus Christ, and building upon that in the areas of gifting and biblical world view. It is our vision that our children will grow into teenagers with a strong belief system as they continue to mature in their Christian walk. Grace In Community Church's Children’s Ministry is devoted and dedicated to teaching, loving and encouraging children to know Jesus in a personal relationship and to walk in their gifting. We endeavor to build a strong bold Biblical world view that will not be shaken. We truly believe that children are a gift from God and are treated as such. Children's Church is held every Sunday. Children ages 5 & up are dismissed from the Sanctuary following the Sunday morning music worship service, and head downstairs to our classroom areas. Our Children's Church classes are exciting, educational and always dedicated to using four important teaching methods, which are hearing, touching, seeing & participation. Children are encouraged to memorize Bible verses pertinent to the lesson, participate in class projects, object lessons & crafts. Each child in our classes is respected as being unique and special, and they are treated as such. Our teachers are experienced, dedicated and trained to incorporate the four teaching methods mentioned above. We utilize The Forever Seed curriculum in our teaching. Nursery Care is available for ages Birth through 4 years of age. Your young children are cared for a by a loving staff. 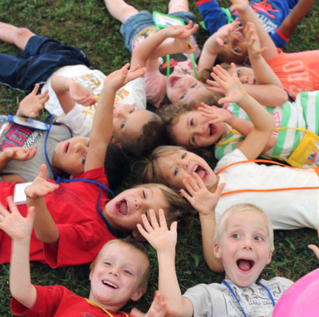 Each class session is filled with age-appropriate Bible stories, songs, snack and playtime. Nursery care is available starting the same time that children are dismissed for Children's Church, following Sunday morning music worship service. Our Nursery is located upstairs; you can exit through the door at the front of the Sanctuary. One afternoon every week, Grace In Community Church facilitates an after-school Bible Club for the students of Alden Primary School on Wednesday afternoons. For more information or to obtain a registration form for your child, please contact the Alden Primary School office. Please Note: Bible Club is for Alden Primary School students only. If you are interested in volunteering your time by helping at Bible Club each week, please contact Pastor Mark or Nancy Walker.